Measurements: 2.62 x 4.7 inches, or 66 x 120 mm. Back of card: Lovely intricate greens. In the center, the image from the 9 of Cups, once on top, inverted on the bottom. May be inverted. Booklet included: Yes, the usual Lo Scarabeo leaflet of 14 panes. Each pane: 2.65 x 4.7 inches, or 67 x 119 mm. Publisher: Lo Scarabeo. Imported by Llewellyn. Printed in Italy. Comments: Gnomes are wee folk who live underground & guard treasure. They are associated with the element earth, which relates them to Pentacles in Tarot. Lupatelli has a good grasp of these small people: Materialistic, playful, almost mindless, or so I imagine them. His illustrations are both evocative & delightful. Over each major arcana card is the name of a gnome, but nowhere in the packaging does it introduce these people, a pity. 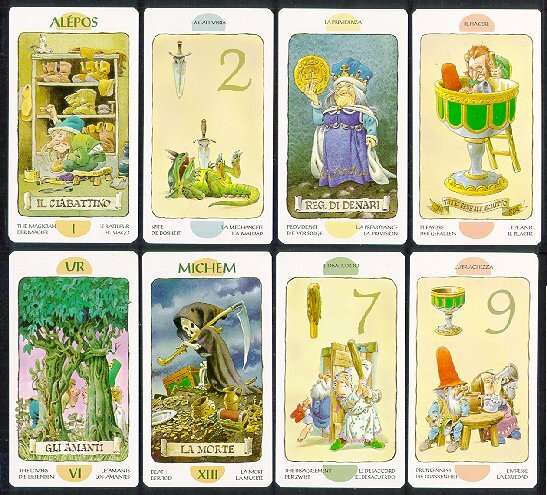 At the top of each major arcana is the proper name of the gnome, in its Italian spelling. In the scroll at the bottom is the name of the major arcana card, also in Italian. Translations for English, German, French & Spanish is given in small letters on the very bottom. On the minor arcana cards, keywords are given. Italian on top, the other languages on the bottom. There is a minor problem with the face cards, where the names are given only in Italian, and abbreviated for three of them: Fan., Cav. Reg. & Re. This deck was previously imported by US Games. I like this deck, I hope you do, too.